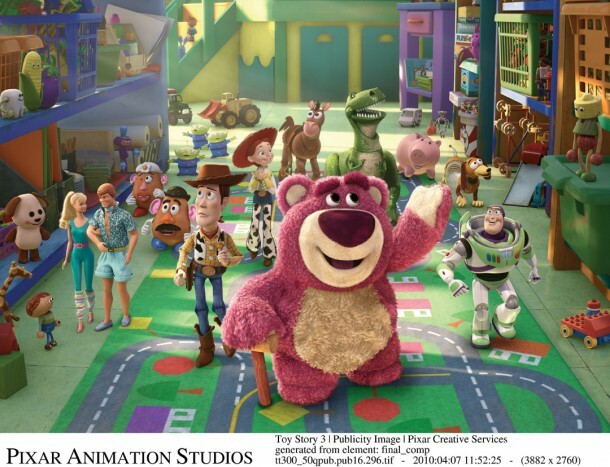 This summer, the first new Toy Story movie for over a decade took Woody, Buzz and the gang into the new millennium. 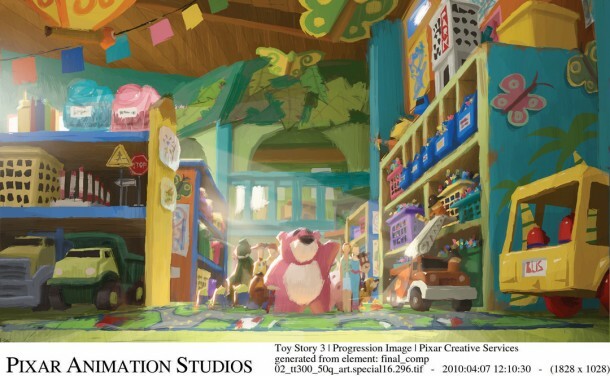 To accompany Fernando Caire’s review of the film’s Blu-ray release, we take a look behind the scenes of one of the shots from the movie to discover how Pixar brings its characters to life. 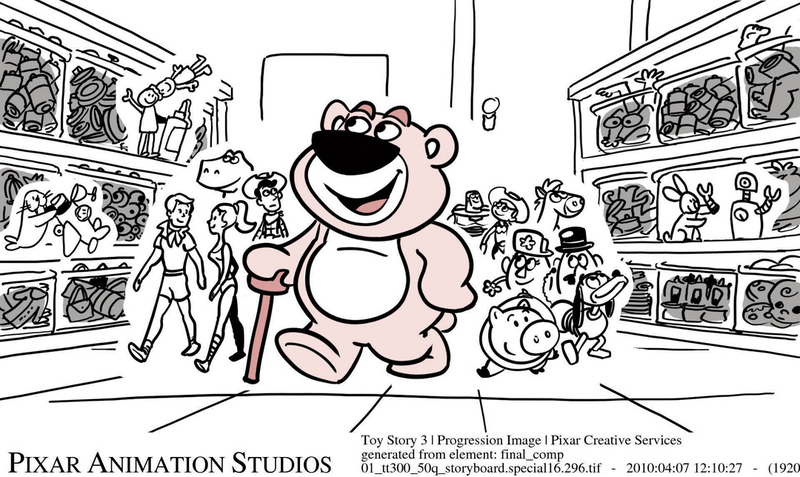 This storyboard was drawn by Toy Story 3 story artist Jeff Pidgeon and is one of approximately 500 drawings done by various story artists in the final storyreel of Sequence # 300 – Warm Welcome, where the toys are welcomed by Lotso and tour the Butterfly room at Sunnyside Daycare. This concept art piece was done by Toy Story 3 Art Director Dice Tsutsumi, showcasing the exploration of color and design of new characters and new environments. 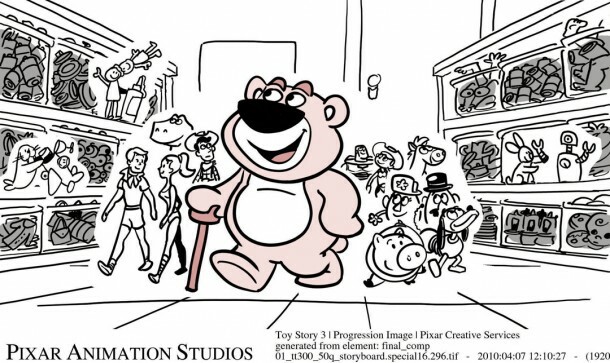 This frame shows the camera and staging phase which precedes character animation, known as Layout. The set is not fully built at this point and is finalized once layout is finished. Some background toys are still not present. Set dressing is also not final and will be refined once animation is completed. Final character animation poses. 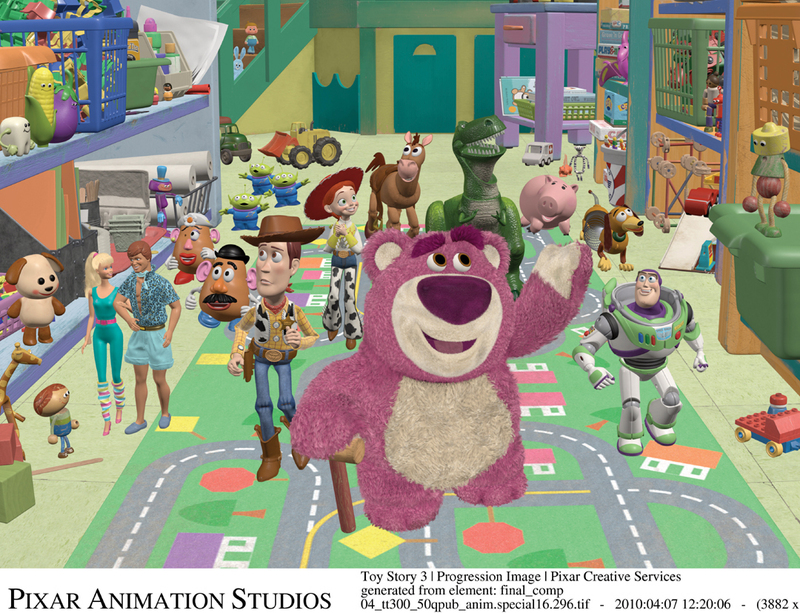 The primary and secondary characters are animated by keyframe. Hundreds of background toys are populating Sunnyside Daycare. 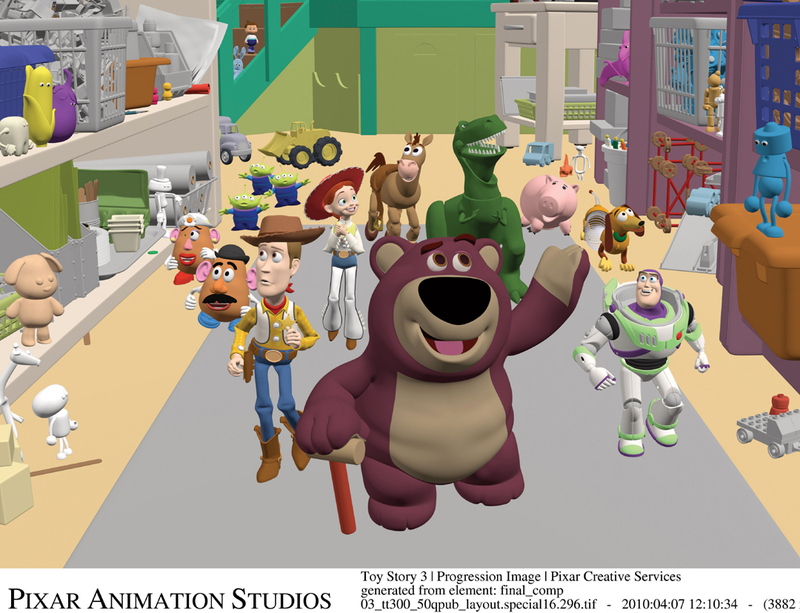 Final animation of the characters’ clothes, which is animated by dynamic simulation. In this shot, Barbie and Ken clothes are simulated. This final frame shows the final shading for the set and all of the surfaces have texture, color, patterns, and material properties that will respond appropriately when lit by the Lighting Department. The Lighting Department is responsible for integrating all of the elements (characters, set pieces, cloth animation, and so on) to create the final imagery. The lighting is achieved by placing virtual light sources in the scene which illuminate on the characters and the set. Many dozens of lights are often required, as well as lighting effects such as the shafts of sunlight seen in this shot. Lotso was a particularly challenging character for the Shading and Lighting Departments because he is completely covered with fur. 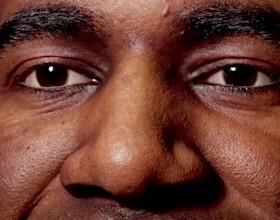 Toy Story 3 is released today on DVD and Blu-ray.